Without a doubt the most vital part of a BMX bike. 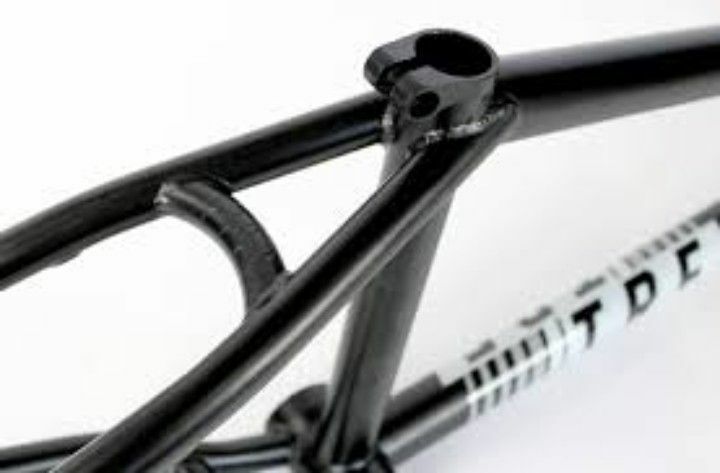 Many people don’t realise but hundreds of BMX frames are released every year in every colour, from matt black to oil slick, and in many different materials. 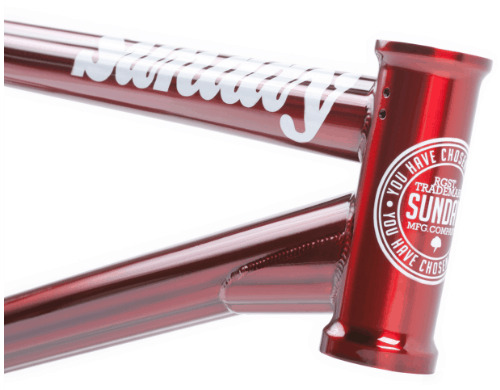 Professional riders are getting signed and dropped constantly and a big thing they all love to do is create a signature frame. 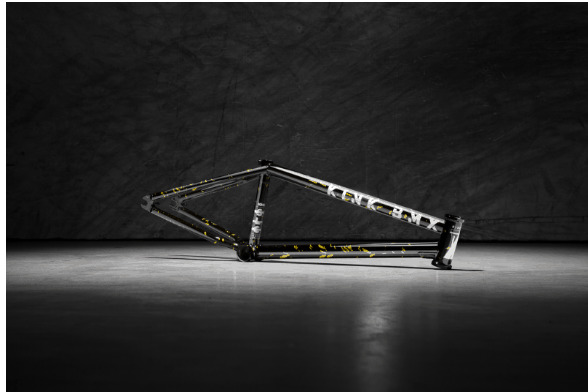 One of the newest and most controversial people to get signed and subsequently design a signature frame is Adam LZ. He runs his own BMX clothing company and YouTube channel called LZ BMX. This list is definitely not a full list of every BMX frame or signature BMX frame made in 2019, although it’s some of the most popular and also my favourite frames of the past year. 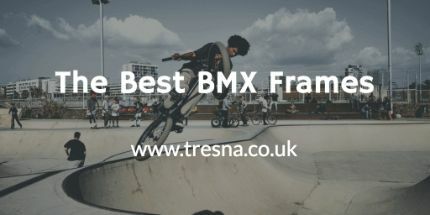 Count this article as a big 2019 BMX frame review. 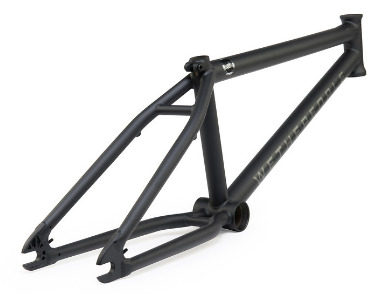 Released back in July the new Hangman frame by Fit is a cool, clean and raw frame. You either love them or you hate them. 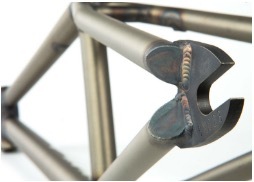 The Fit Hangman frame features those awesome welding scorches on each joint. With his very aggressive riding style, Jordan Hango designed this frame to perfectly suit his needs. He included a larger ½” down tube and much thicker ¼” dropouts which gave the frame added strength to withstand heavy abuse. Manuals and pumping can be executed with ease whilst riding this frame due to the thicker tubes. If you’re a larger or more aggressive rider and enjoy that raw, classic feel and look then this is definitely a frame a frame to look at. Made by a great American company for an awesome Canadian rider. 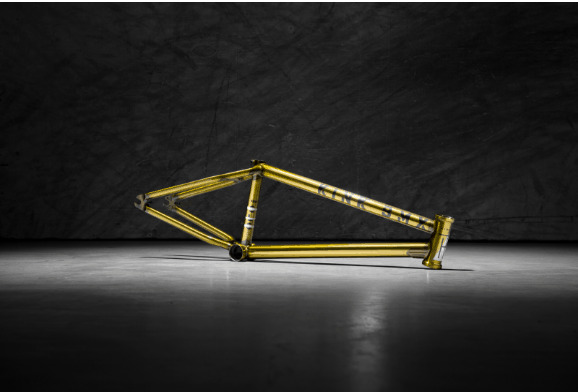 At $360 it could be a worse price for the extra strength and having such a great rider design the whole frame, the dimensions are obviously nothing to worry about. 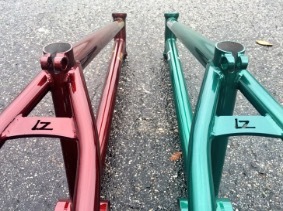 Rear End Length: 13.4" - 14"
Sizes: 20.75", 21", & 21.25"
After following Adam LZ through his YouTube channel and clothing range for a few years now it’s quite interesting to me that he’s getting to design his own BMX frame with Stranger Co. Only very recently released its much anticipated for all his fans all over the world. Without a doubt, there are thousands of people that are ecstatic that he’s riding for Stranger but a few other riders have had a few problems with it and one rider even left the team. 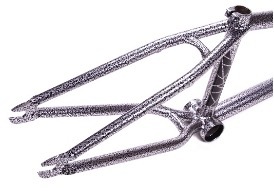 Made fully from 4130 Chromoly tubing with a 75.5-degree head tube angle. 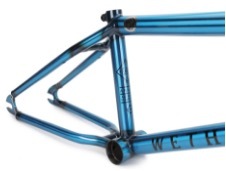 I believe the frame is using a hydroformed top and downtube similar to the Envy frame from Wethepeople. According to Adam, the frame will be the same specs as the Crux frame but lighter. Top Tube: 20", 20.5", 21"
Garrett Reynolds, one of the best and most famous BMX street riders out there at the moment rides for Fiend and he’s probably their greatest asset. Again constructed from heat-treated 4130 Chromoly with an internal gusset in the top tube and also an external gusset on the downtube. Garrett is such a humble rider he waited till the whole Fiend pro team got their signature frame before he even started designing his, this took 3 years, and it’s gone so well he’s already on version two. 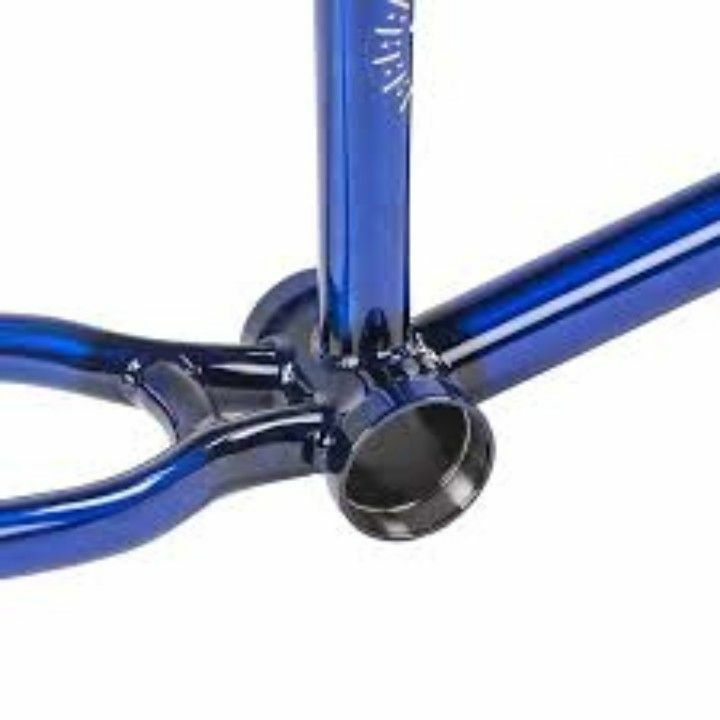 The signature frame of Kriss Kyle made from a beefy Chromoly tubeset with an integrated headtube drilled for gyro tabs. 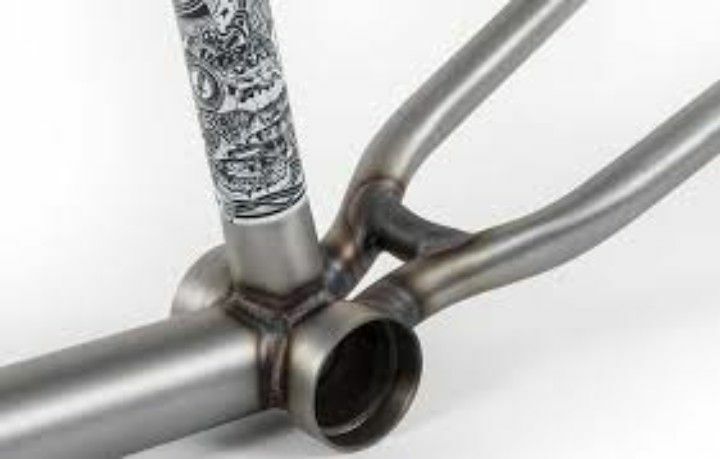 Said to be a progression from the Trailer Parks geometry but with a few extra changes such as a steeper head angle, taller headtube, higher standover and beefier tubing. A great signature frame from Matt Priest and Lima. 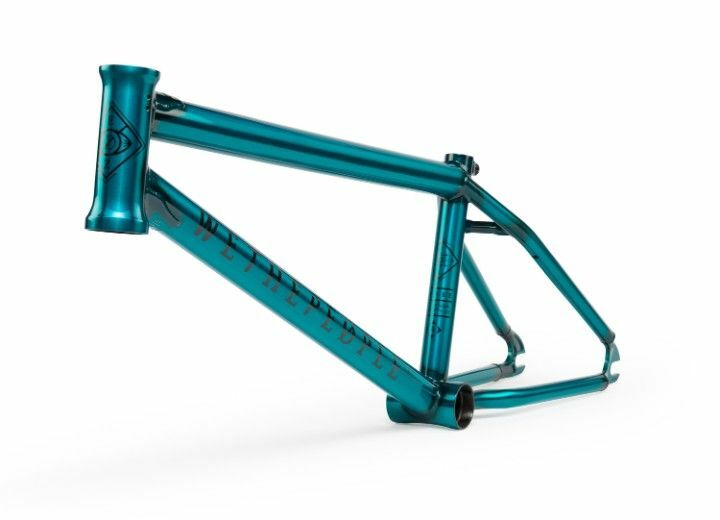 Unlike the Fit Hangman frame, the Verde Oxbridge is made to suit the faster and more technical riding that Matt and Lima sign up to. This frame has a slightly longer headtube than most other frames and so eliminates the need for headset spacers when making your bars sit higher. Both these riders definitely aren’t scared of going high; Matt is more of a dirt rider and Lima a ‘go big or go home’ park and dirt rider they both fit together brilliantly and it seems to create a brilliant Verde Oxbridge frame easily. 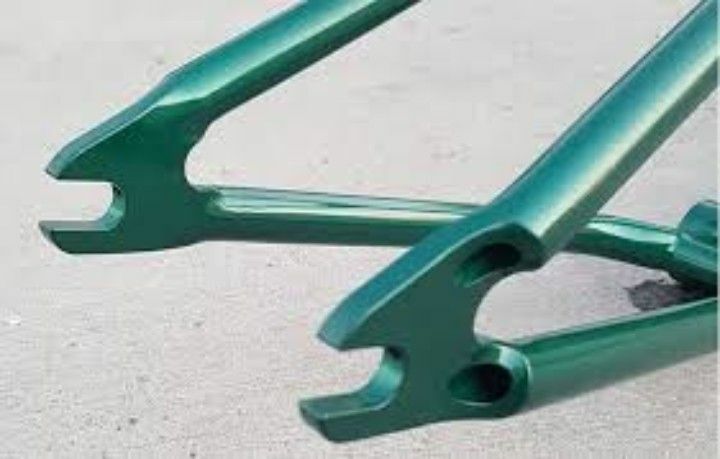 Verde BMX is already a large successful BMX company and these frames are definitely reliable. Ed Zunda designed this specific street frame with all technical street tricks in mind and this shows with the extremely steep 75.5-degree head tube and the backend was also beefed up to deal with those bigger spinning tricks in the environment ridden. Ed and the We The People team are so happy with the frame that they offer a lifetime guarantee with every frame. Unlike some companies only offering two bland colours for their frames; the Awake frame offers everything from the gorgeous matt black to a weirdly translucent frost blue. What does everyone buy after riding a new bike set up? Chain tensioners! 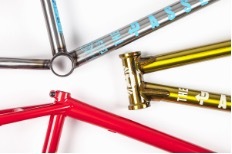 Don’t worry they’re already included in the Kink Titan BMX frame. 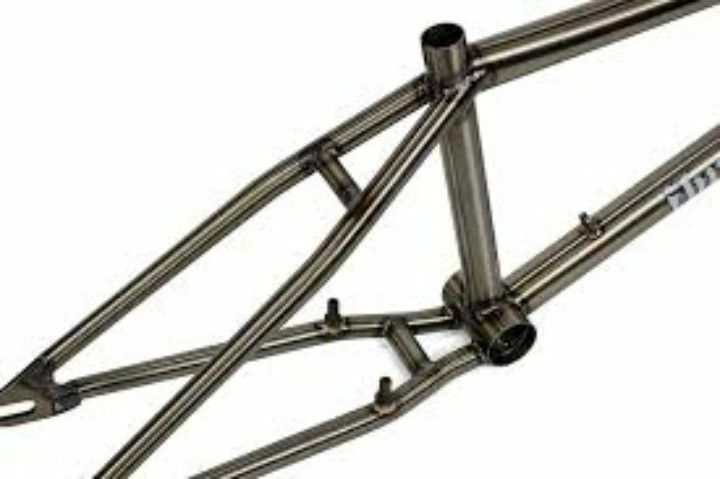 So obviously this is a specifically designed street frame and with its double butted Chromoly, it’s also strong enough to deal with the park and dirt jumps. 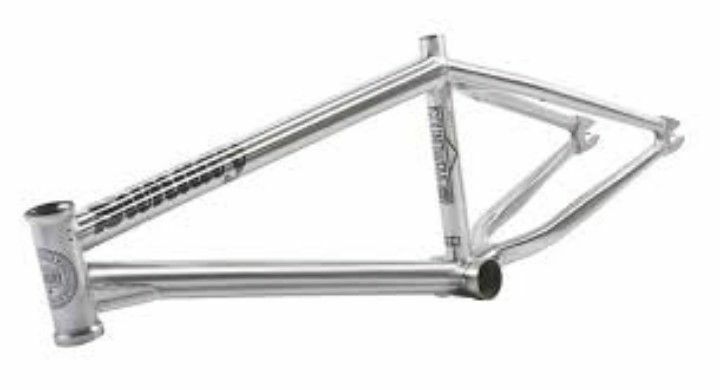 A nice cheap price at approximately $250 and comes in Black Chrome, Chrome, ED Black and raw so there’s enough to choose from if you need it to match the rest of your BMX. A great new frame from Tom Sanders, who was a fundamental part of the process of creating this frame. Originally from the areas surrounding Hull, England; Tom ripped up street spots all over Northern England and became renowned as the BMX street assassin. Sanders got the Region name extremely simply. He basically didn’t believe having his name on the front of the bike would help United sell the frame and therefore came up with the region name to associate with the street riding he’s renowned for. As you can see the specifications below the back end is rather large making the frame less twitchy and also slackening off the head tube to give it that more traditional feel. Tom said the frame makes him feel a lot more in control of the bike and it’s a lot less unpredictable like the Dinero frame he rode in the past. In a recent interview, Tom was talking about his new frame saying he loves the 9-inch standover that eliminated that scooter style look but also helps the taller riders. 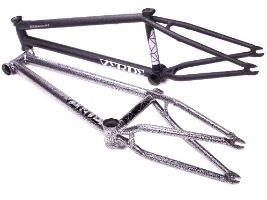 TT Lengths: 20.5", 20.75", 21", 21.25"
Tony Hamlin’s new and improved signature frame from Kink. 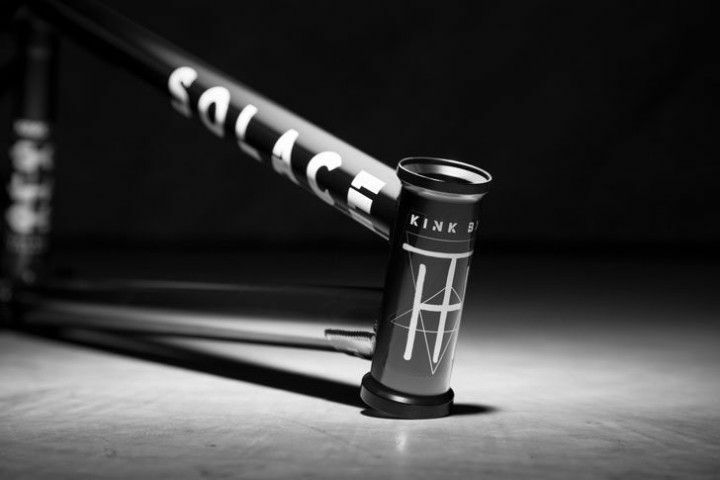 Designed for modern riding styles with the updated geometry from the Kink Solace II. With 2 new and improved colourways and a 13.2-inch chainstay. Unlike a lot of bikes released in the past year, the Solace III is seamlessly made from Sanko tubing and also a downtube gusset to deal with that additional abuse from more aggressive riding styles. If you’re more into the smaller more skilful tricks like manuals, nose manuals or front-end stalls then the Solace III could be a great option with the responsive front end due to the 75.5° headtube angle. 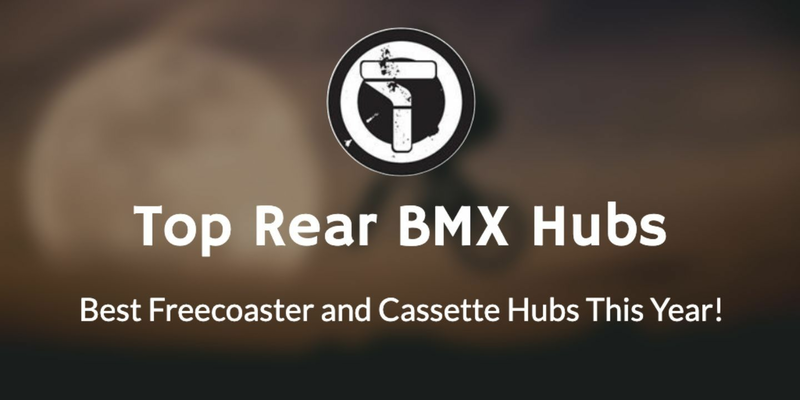 It’s very common for BMX riders to take off their brakes for the ease it gives you with tailwhips and barspins but unusually Tony decided to take all the brakes, brake mounts, cable stops and even gyro tab holes. Integrated chain tensioners and seat clamp also add to the frame’s convenience. Sunday are definitely promoting this new frame as more of a full chro-mo version of model C complete frame but at the same time a much more affordable price point than the Wave C frame. The wave tubing, found on the model C is gone along with the wishbone back end have been replaced but Sunday have kept exactly the same geometry. They have done this to make it more accessible to people with a tighter budget but still, love the Model C frame. As you can see from the images below the Sunday Model C3 frame is actually built for 24” wheels although many reviews are saying that the feel is just like a normal, stable and responsive 20” BMX frame. Certainly, one of the taller riders to look at. There are some cool new features in this updated frame. Tapered chain and seat stays are used to provide a clean look to the back end whilst keeping the strength high. Both are also angled on the inside for improved chain clearance and weight savings. 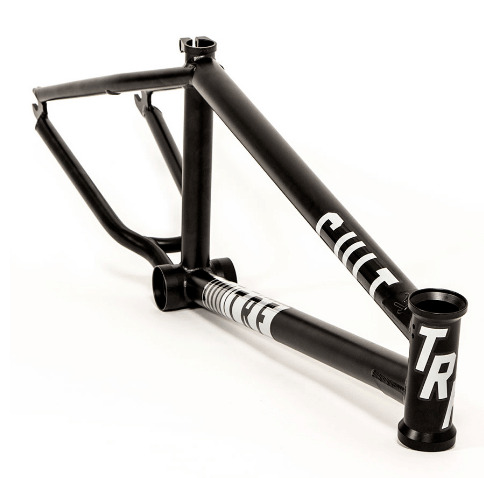 A new trail/race frame from Cult. Made from 100% revised Cult classic tubing and featuring an integrated headtube, top tube gusset and embossed Cult logo. The Mid BB shell has been externally machined and an integrated seat clamp has also been fitted to the frame. The new TRF is definitely a machine on the dirt jumps. Specifically designed to feel extra stable whilst giving you that extra speed you need in a race frame. 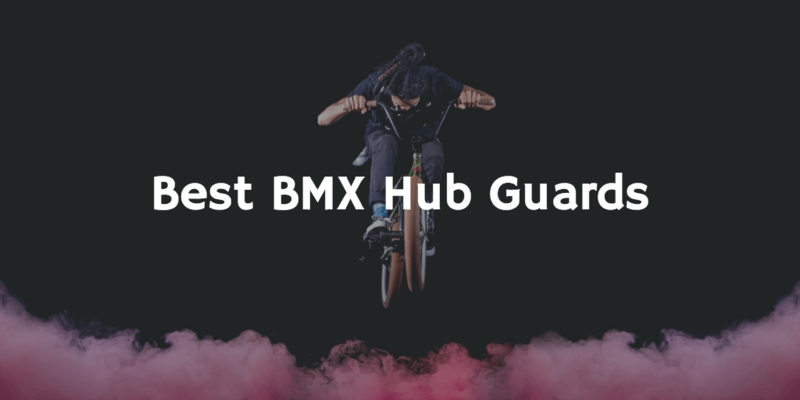 As normally featured on BMX frames designed for dirt jumps; the back end is slightly longer than normal to give you that stability when hitting jumps whilst reducing the likelihood of looping out. 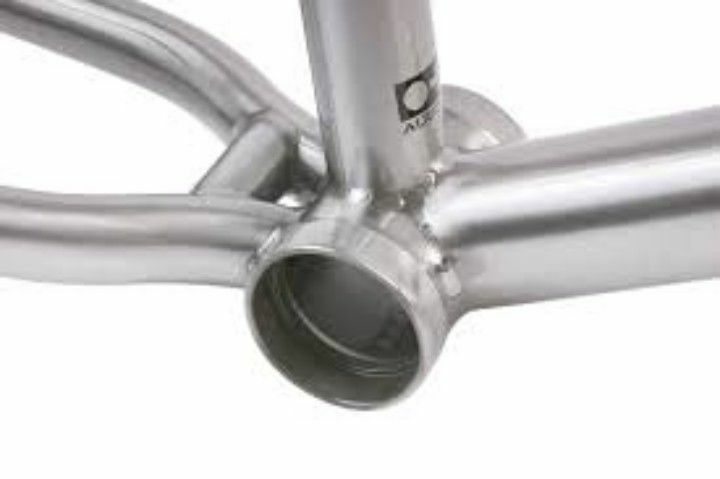 The headtube angle is a little slacker to give the rider that durability for carving and riding bowls. I think this is a great frame for BMX dirt jump riders like Dawid Godziek and Mike ‘Hucker’ Clark. Whilst they both have two very different riding styles they both love to go big and I think the Cult TRF is a reliable way to do that. 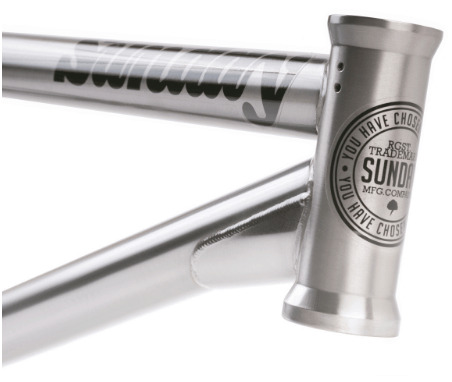 Way back in 2007 Sunday launched the Wave series of frames and the Soundwave is the latest addition to the club. If you have ridden or seen a soundwave before then you’ll be sure to know that there isn’t much that comes up against it in terms of strength. There are also some nifty modern features offered too. 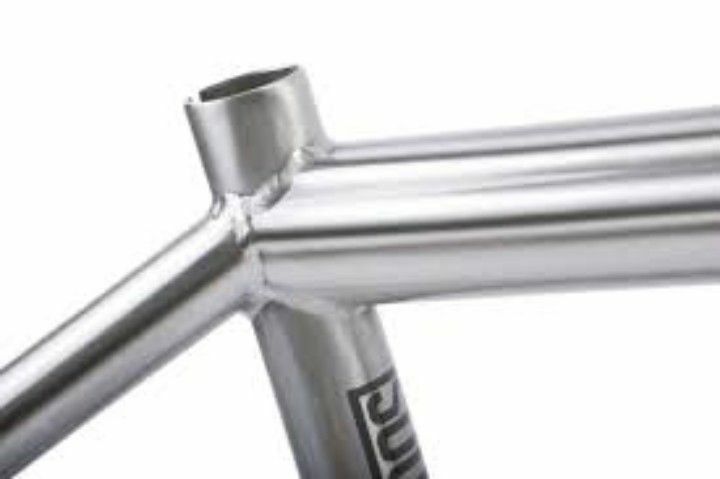 The chainstays are a ‘Boxed’ tube shape to prevent that annoying denting every time you land with your chain even mildly loose. This ‘Boxing’ also allows a shorter rear end and clearance for a bigger wheel. This shorter rear end helps a lot with manuals and balancing tricks although it means you can loop out much easier when on dirt jumps. 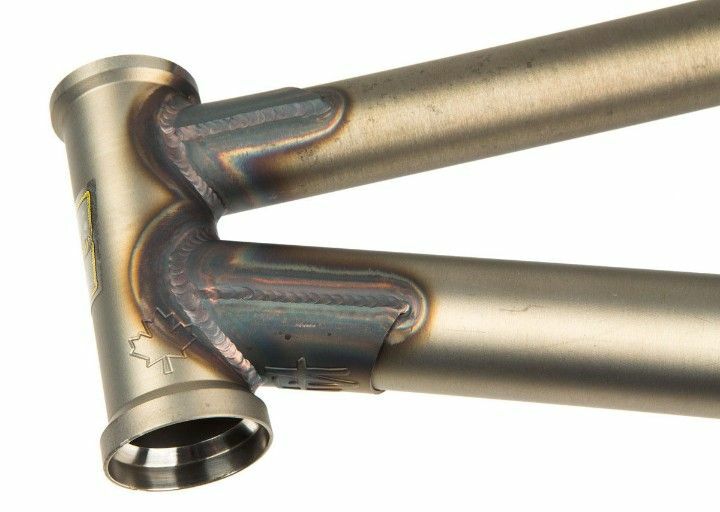 Top Tube Lengths: 20.75" and 21"
Chainstay Length: 13.5" - 13.75"
As you expect from WeThePeople every detail is spot on from smooth welds to an even paint job over the whole frame. 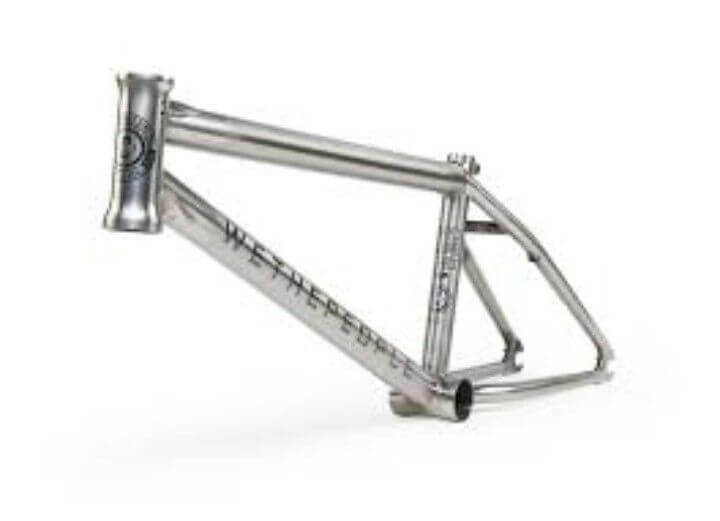 WeThePeople has basically taken the Trust frame from the complete bike and added some nice aftermarket touches to gain that unique selling point every buyer looks for in a new frame. A lifetime guarantee is also included with this frame which immediately shows that the company believe in the product. Team riders Mike Curley and Dale Armstrong ride this frame and definitely represent it well. Like a lot of frames featured in this list, the Clash frame has quite a large rear triangle to accommodate a 2.4” tire. 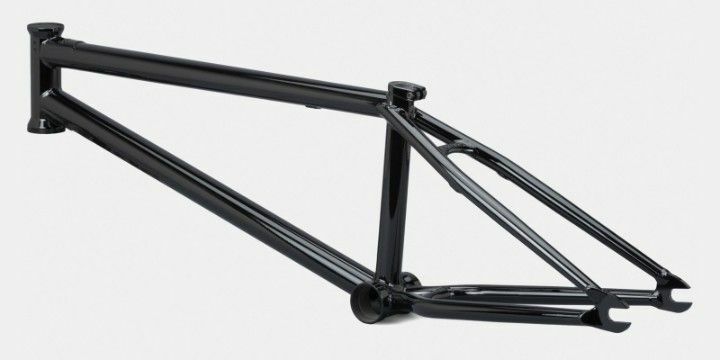 The FBM Hardway, with its refined geometry and great graphics, resembles the essence of what it is to be a street BMX frame. 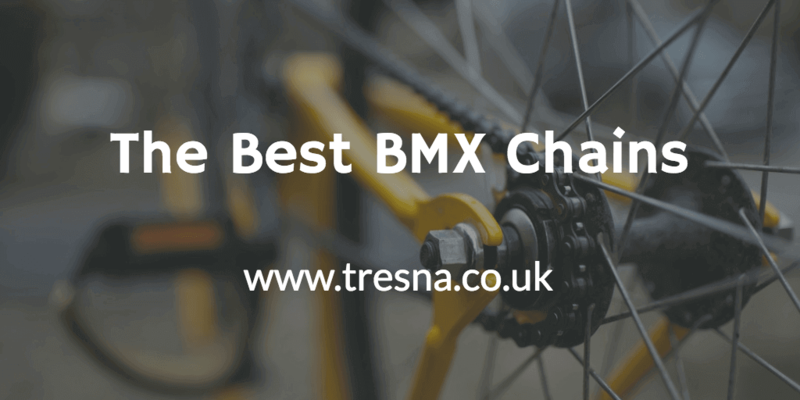 Said to be a little heavy which can annoy many riders as it makes the frame a lot less responsive. This extra weight and refined geometry make the frame much easier to throw around whilst keeping stability and strength. 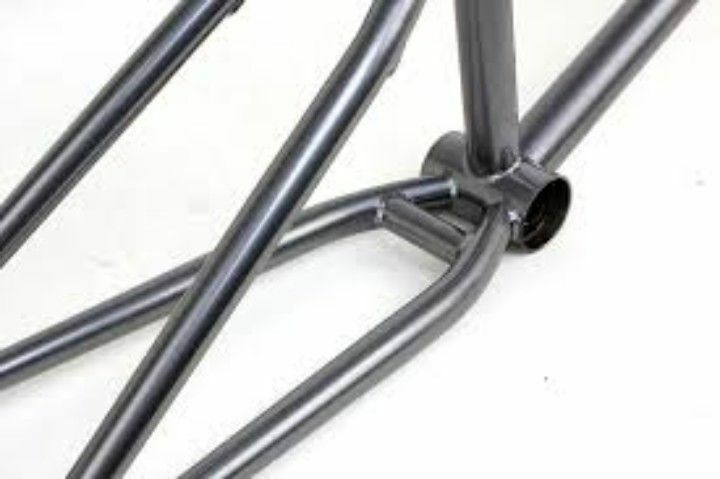 A special straight gauge downtube used on this frame to reduce the ease of denting and to protect the frames integrity. This frame seems to have been designed for every rider to enjoy. The clearance for up to a 28t sprocket enables riders who like a larger sprocket but also a smaller one to pedal and gain speed easier. 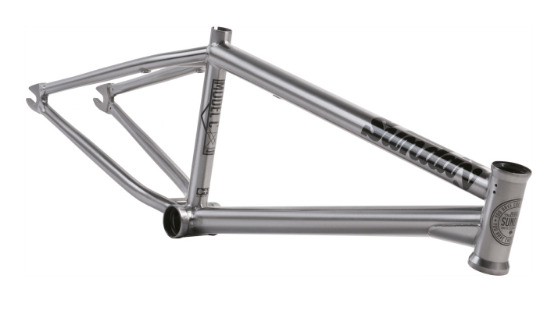 Top Tube Length: 20-1/4", 20-1/2", 20-3/4", 21", 21-1/4"
Simply a classic frame. The geometry and design aren’t attempting to be anything they aren’t. A mellow 74.25-degree head tube angle, a nice long wheelbase and taller standover to keep the bike stable at high speeds, going high and whilst doing spinning tricks. I think this year's model is one of the most reliable frames on the market. The reason for this is that in the previous years they had already near on perfected the design, specifications and geometry and this year all they did was tweak some geometry and what came out was a dirt jumping machine. These minor changes include the steepening of the headtube by a quarter of an inch. The rear end has been tightened by an eighth of an inch and the standover height has grown by a quarter of an inch. The chainstays have been slimmed down to .049” thick. The new colourways include trans brown, flat black and clear.